Definitely the best in the Franco Gasparri/Stelivio Massi poliziotteschi series. Compliments must be paid to the movie's exciting, labyrinthine script, which features a solid plot involving kidnapping, rival gangsters, a vengeful psycho sniper, and the exploitation of a mental patient! Movie features the execution of a newlywed bride and a super-funky opening theme right off the bat. 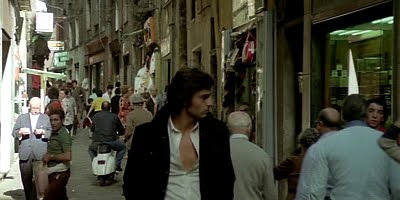 The diverse Genova locations give the film a lot of scope and color, embellished by Massi's insistent rack focuses and insatiable appetite for the zoom lens. Not to be praising of the movie's assets too much, as a truly reprehensible ballad is trotted out on the soundtrack, entitled So Much Love, that Gasparri even plays on his own 70s hi-fi. Curiously, the movie remains pretty bloodless, despite the high caliber roars of Gasparri's magnum, plus refuses to feature any decent "splrrrch!" during a warehouse showdown involving factory equipment. Undoubtedly, a Lenzi or a Castellari would have honored us with some squishy, slow-motion atrocities in such a fertile environment. A car chase with an Alpha Romeo does provide a dose of vehicular destruction early on, and the climax in the Genova harbor, atop a gigantic industrial gas tank, fulfills any crime movie devotee's appetite for both location dazzle and the movie's welcome, downbeat, "Dirty Harry" ending. This, a must for the genre. An unhelmeted Gasparri, speeding through Genova traffic on a motorcycle, is a tragic image, considering the actor's tragic accident in 1980.